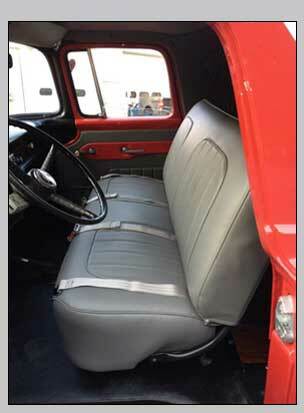 •	Repairing and/or replacing of seat covers, carpet, headliners, door panels and trim pieces. •	Repairing and/or replacing of foam and padding. •	Repairing and welding of seat frames. •	Installing rubber mat flooring. •	Custom coated vinyl tarps and covers for dump trucks, fire trucks and other heavy transport vehicles. •	Custom roll covers, garbage and storage containers. We also offer a full range of commercial vehicle accessories and installation for most accessories.